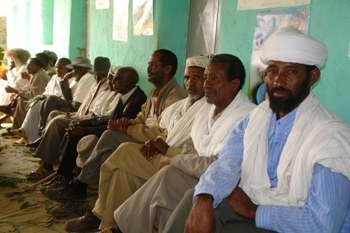 Ethiopian men attending a Tigray community meeting. Health care in Ethiopia is underdeveloped, in part due to severe transportation problems that make access to any type of modern health institution a challenge. It is estimated that 75 percent of the population suffers from some type of preventable communicable disease and/or malnutrition. In 1998, the Federal Government of Ethiopia established the Health Sector Development Program (HSDP), which incorporates a 20-year health development strategy divided in 3-to-5 year rolling plans. The HSDP works to decentralize health services, develop preventive health care, and build capacity within the health service system. It promotes equitable access to health services, self-reliance, inter-sectoral activities, participation of the private sector, as well as collaboration with all countries in general and neighboring countries in particular and between regional and international organizations.